It could involve a decorated car - or perhaps a glass of root beer? An inflatable raft? You decide... and then enter yourself in the "first-time-on-the-planet" Banana Slug Parade in Downtown Santa Cruz. This parade is part of our community's celebration of the 50th Anniversary of UCSC. Think about it: a parade in this innovative and creative community built on the theme of Banana Slugs. It's going to be awesome and hilarious and something you need to be a part of. Get your organization, your friends, your yoga club, your astronomy class or your ukelele team to come up with an amazing parade entry and sign up through the link on the Banana Slug Parade event page on Facebook. There will be awards and prizes for the top entries. We ask that all entries have a thematic connection with UCSC or Banana Slugs. 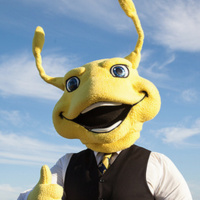 For more info visit the Banana Slug Parade Facebook page. This parade and the downtown festival celebrating UCSC's 50th Anniversary on October 25 is being organized by the City of Santa Cruz and the Downtown Association.